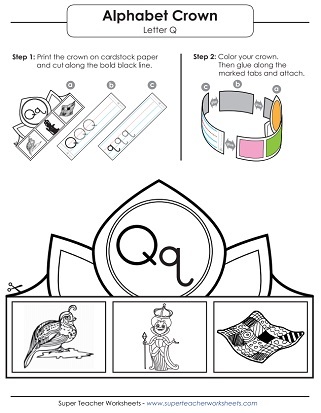 Color the queen and the quarter, then practice writing letter Q q on the primary-ruled lines. This version has a curl on the end of the letter. This is an alternate version of the worksheet above. This version has a lowercase q with a pointed bottom. Here's another alternate version of the worksheets above. This version has a straight lowercase q. Trace, write, color, cut, assemble, and wear this crown like a queen (or a king). Learn to write lower-case q on this worksheet by tracing along the dotted lines. Use a pencil to trace along the gray lines to practice writing lower-case q. Use this worksheet to allow your students to practice writing capital letter Q. 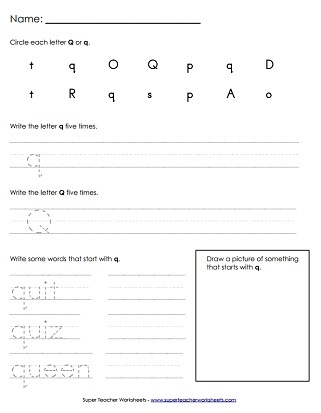 This printable worksheet is a good way to practice writing capital letter Q. Find the Qs, then write some Qs, then write Q words. Practice letter recognition by dabbing the circles with colorful ink dabbers in the shape of letter Q.